Place a medium saucepan over moderately medium heat. Add the almonds to the pan to toast, tossing them every few seconds to ensure even browning, for 5 minutes and until the almonds are golden brown. In a large bowl, combine the toasted almonds, white rice, sugar, cinnamon stick, lemon strip, vanilla bean caviar and pod, pinch of salt and filtered water. Cover the bowl with plastic wrap and transfer to the fridge to sit for at least 6 hours, ideally overnight. Remove the lemon strip, vanilla bean pod and cinnamon stick from the mixture. Place a cheesecloth-lined sieve atop a large bowl and set it aside. (Note: I found it necessary for the cheesecloth AND the sieve as it gets a bit gritty if not.) Transfer the mixture to a blender, in batches, and pulse until the horchata is nice and smooth, about 2 minutes. Pour the horchata into the sieve and discard the almond bits. Transfer the horchata to a pitcher and refrigerate until cold, about 1 hour. 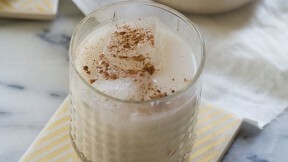 Serve horchata over ice with a few dashes of ground cinnamon on top.